You’re on a tropical beach overlooking the warm waters of the Caribbean. It’s time for a drink. 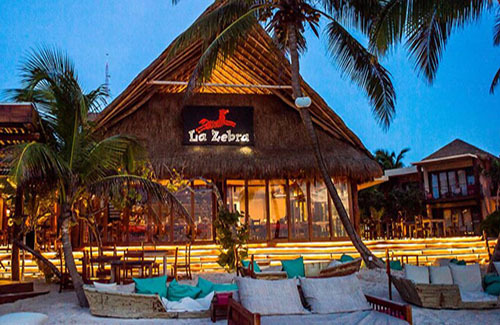 Enjoy your favorite cocktail at the new Mulberry Project pop-up at Colibri Boutique Hotels’ beachside La Zebra hotel in Tulum, Mexico. Colibri Boutique Hotels collection consists of five properties in Tulum, Mexico (La Zebra, El Pez, Mi Amor, Mezzanine) and Little Corn Island, Nicaragua (Yemaya Island Hideaway and Spa). Designed for relaxation, the “Barefoot Chic” collection includes Found behind the La Zebra hotel is the Mulberry Project “rustic chic” bar. The Mulberry Project is recognized for pioneering the bespoke cocktail concept. Enjoy life and try a personalized cocktail experience. The mixologists are using the best tequila, rum and mezcal to create delicious cocktails. The pop-up bar on the beach is fun atmosphere where you can order your own unique drink. Don’t get stuck ordering off a menu. First select your liquor base, then choose ingredients that suggested on a chalkboard. Mix and match and get creative! You can choose from market-fresh fruit, delish vegetables, plus various herbs and spices that are available that particular day. Next, decide on the type of cocktail you enjoy drinking. Maybe refreshing or sweet? How about spicy and tropical? Or what about dry, bitter, smoky, herbal and many more? Once you have decided, the talented mixologists are ready to create your ideal bespoke drink. How fun is that? Since you are in Mexico, how about smoky mezcal concoction? Try some local, Mexican ingredients such as mole bitters. Under the direction of talented Chef Eleazar Bonilla, you can try these delicious cocktails at the La Zebra’s restaurant. Enjoy local cuisine and a great selection of drinks. Are you ready to take a luxury, tropical vacation. The concierge specialists at The Life of Luxury can help you plan and book your next getaway. We can offer all-inclusive packages or unique VIP experiences. We hope come back soon to follow this luxury blog. Travel to Mexico and try awesome cocktails at the Mulberry Project.